The Zinn Life: Spring Must Haves! I don’t know about your weekend, but mine was pretty awesome. It was so pretty the whole weekend! We went to the auto expo Friday night where we learned that Sarah likes the big and expensive SUVs, even though she doesn’t want to have to park them. We hung out with our friends Saturday night and on Sunday I hung out by myself because Aaron worked this weekend. It was glorious. If you ever want to know how to make me 100% happy, leave me alone for a day after two full days of people. This weekend I did a lot of work on my closet because next week is MARCH! Also, it has been gorgous outside! March means spring capsule wardrobe time and I. Am. Pumped! Not that I don’t love winter clothes (I do – they hide all queso sins), but there is something about spring. I still get to stay mostly covered, but everything is more fun: the shoes, the colors, the prints. And even better, most of my spring clothes from last year don’t fit, so it’s kind of like having all new clothes again since I haven’t seen some of my older shirts in a couple years. This also means, though, having to replace some items. I went through all of my spring items and determined what a) didn't fit anymore or b) I didn't actually wear. I was able to sell a few Stitch Fix shirts and consign other items to Clothes Mentor. Between the different sales, I made about $110 to help fund my new items! I've started to determine what items I'm keeping from the winter capsule, what I'm adding and what I need to replace. So, in preparation for next week, here's my list for my Spring capsule! Note that there are affiliate links in this post. 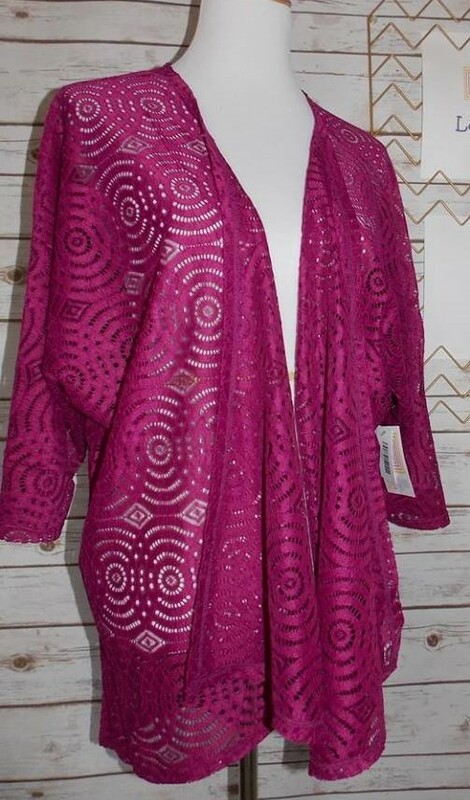 My beloved Target magenta cardigan has officially been retired. It got...crusty. That's the best term I could come up with. You know when you've washed something one too many times and it doesn't feel right anymore or lay right? That's what happened to mine. I'm hoping to replace it either with a LulaRoe Lindsay or with a Stitch Fix cardigan. It has to be magenta, though. I live in that color! LulaRoe Lindsay. I'm looking for this color, but in a solid fabric! I have a pair of adorable little Peter Pan-esque booties but the fabric on the toes is just coming off like nobody's business and they need to be replaced. All these cute little perforated booties keep popping up in my emails and I've decided that I need a pair! Plus, I consigned two pairs of shoes this past weekend, which means I get to buy more! Score. I really like this pair and the heel height. I can wear them with jeans or with a dress. This happened this weekend! I finally, finally bought my purse. I've been purse hunting for a while and I hate it because I am so dang picky. I pick one and wear it until I've worn it out, which is what happened to my trusty Dooney. 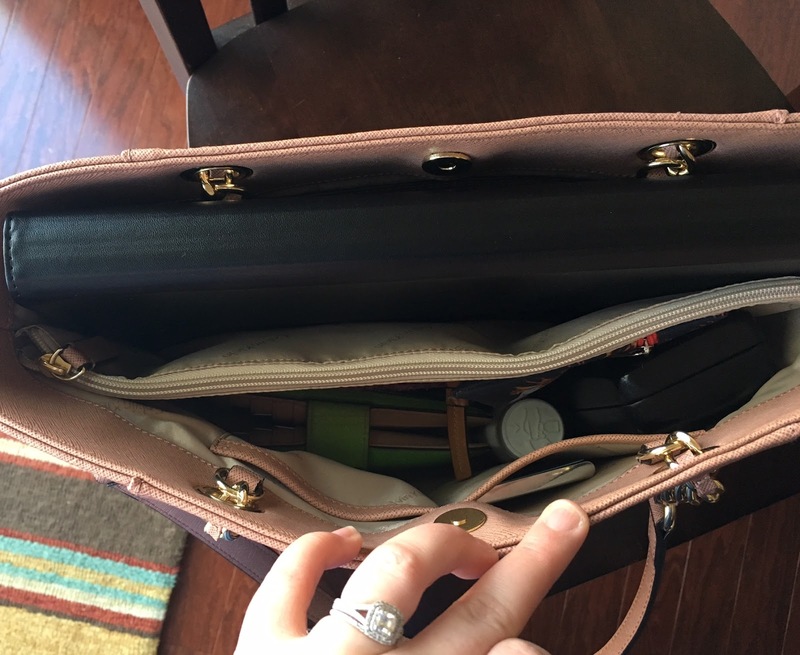 My normal requirements for purses are leather, or another durable material, and the strap has to go over my shoulder comfortably. This time, I also added a few more requirements such as holding my laptop. I have been stalking this bag for a while. I had others that I was looking at, but I really liked all the features this purse had. It wasn't just a tote like the other bags I was considering. It had pockets on the side, so I can actually find my phone, a zip divider inside and four pockets and a zip pocket on the back wall. So it functions like an actual purse, but it can also handle carrying my laptop or my planner and files. I can look like an adult now when I travel! 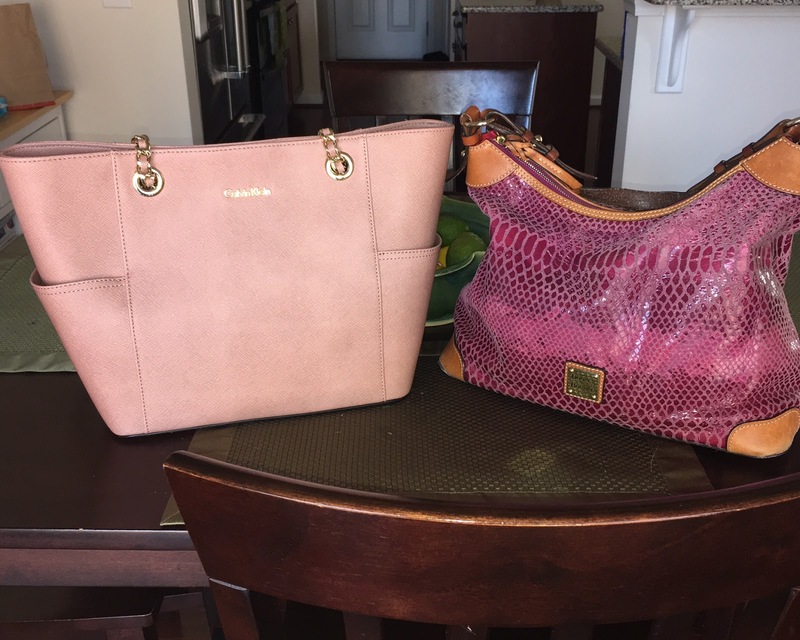 New purse and sad old purse. Fully loaded with the laptop and all my regular items! I know I'm late on this trend, but I wasn't really sure how I was going to feel about midi skirts. A short girl doesn't generally do well with skirts that hit below the knee, but I've really embraced the midi skirt! It started with LulaRoe's Lola skirt. I snagged one of the Elegant Collection Lola skirts and while it didn't end up working around Christmas, I've tried it out with some of my spring tops and it's going to be perfect! Now I want another one! One with big bright flowers. I also really like the A-line of this midi. Once upon a time, pencils were my thing. Now, not so much. I'm definitely going to be getting one more midi skirt for this upcoming capsule. I also need some more pants, but I don't have any particular requirements other than bright colors! I always try to have at least one pair of ridiculous color pants per season. Just makes life more fun. So what are your must haves this spring? Also, I'm adding new yoga pants to this list. One always needs more yoga pants! So fun! I love that magenta sweater - good luck finding a good replacement!